Below are all of the Cream & Neutral dining chairs from our full selection of seating. All of the Cream & Neutral colour dining chairs are chosen from our Fabric, Leather, and Wood catalogues. If you need any help regarding any of our Black Dining chairs feel free to contact one of our team. 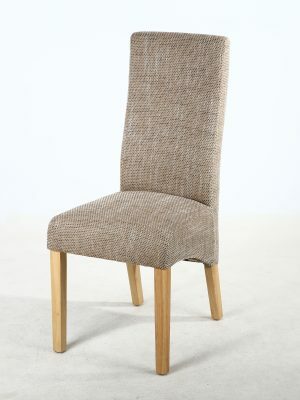 All of our Dining chairs come with a quality Guarantee and are delivered free of charge Nationwide. 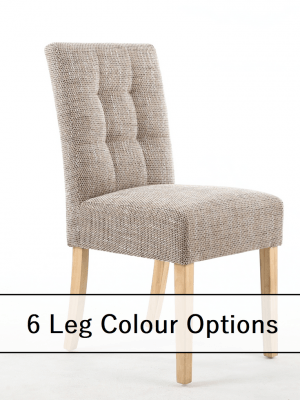 The Christian Stone Cream Linen upholstered Fabric dining chair is a very Stylish Wave back design dining chair in an attractive Cream Linen upholstery that is both hard wearing and neutral in colour, designed to fit neatly into any existing decor. The attractive curved back rest is made from solid hardwood frames and the seating area is steel sprung and nylon strapped for a very comfortable sit, and to provide a long life on the seating area. For Full description and sizes please see below. The Harley Natural Linen Quilted Fixed Leg Dining Chair is a perfect combination of Functionality, durability, and Style. The soft to touch linen upholstery is a thick weave linen that is both hard wearing and attractively laid onto the frames in an eye catching and stylish Quilted design on the back of the chair and tufted design on the seating area, serving both as an attractive design and extra padding for a more comfortable sit. For Full description and Sizes see below.